Formatting issues on the blog are a little screwed right now. -hope to have this resolved in the next few days. 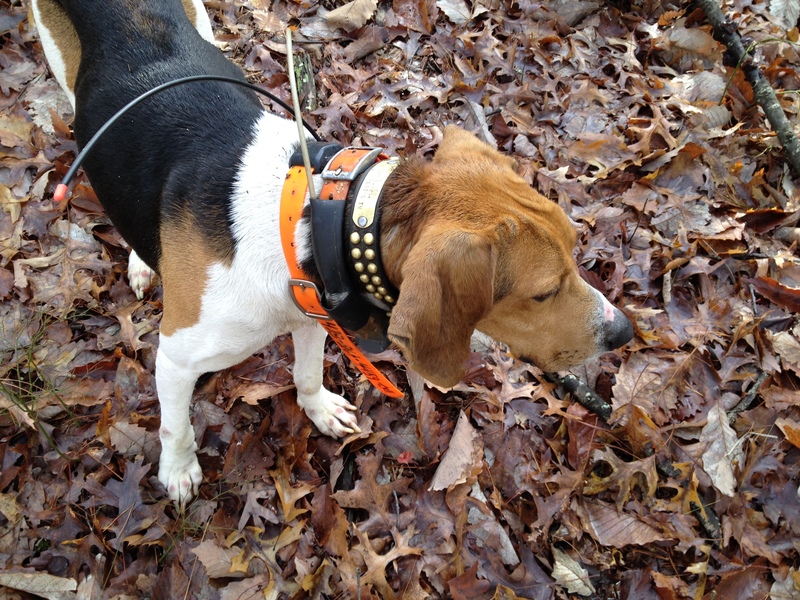 Hunters as individuals come from different backgrounds and variable walks of life. In spite of this, hunters often get thrown into one category: “Hunters.” On a certain level, this singular categorization is understandable and likely even necessary when championing causes that affect all of us, though “hunters” defined as a singular user group also makes it easier for the non hunting world to judge us. A recent piece featuring Chef Jesse Griffths, author of the tremendously well crafted cookbook “Afield”, made some comments suggesting that American hunting culture essentially consists of two camps: The new school “Hipster” hunter and the old school “Ted Nugent” hunter. While I understand the need for sensational headlines and claims in order for pieces of media to go viral these days, I have to admit feeling an increasing sense of betrayal from a relatively high profile member of the hunting ranks who consciously created further division amongst hunters by simplistically dividing us into two camps and suggesting that there is a “Civil War” taking place to define the future of American hunting culture. While, sure, there is a growing sub-user group of urban based, “Hipster” hunters and a growing influence within the hunting community of focus on food and cooking, the author uses this platform to create a conflict that does not exist and suggests a complete “changing of the guard” that is not actually happening. If, for the sake of simplicity, we are going to divide American hunters into two camps (old and new), then this particular platform could have been constructively served to show what these two camps stand to learn from one another. Its easy to make blanket statement such as “we are returning to the roots of hunting”, but what does that even mean? What are the roots of hunting? That could suggest disregarding modern game management practices such as having seasons and bag limits. That could suggests killing animals en masse with disregard for weapon legalities and ethical considerations. Hunting ethics are a symptom of modernity, a privilege of excess and, within the grand scheme of nature, survival and the ancient roots of hunting, entirely arbitrary. Oh, by the “roots” of hunting, did you mean ~30 years ago before the age of modern hunting media (Hunting shows, magazines etc)? Do you think that nobody was gardening and hunting animals for food in America ~30 years ago? Any direction you go with this Hipsters vs. Traditionalists, there are problems, falsehoods, misunderstandings, and misdirections. Hunting should not about “taking hunting away” from one type of hunter. The piece is critical of a type of hunter who hypothetically spends $1,300 on a duck blind, yet favors the type of hunter who hypothetically spends $13,000 on a Viking outfitted kitchen. To psychoanalyse those conditions and influences, I think that a lot of young men in recent years have started to look to a previous generation for the definition of masculinity. If you grew up in a rather bland, suburban environment of the 80s, 90s, 2000s where masculine influences were/are largely “tame” compared to examples of masculinity of previous generations, it sort of makes sense. Generation X, Z and Z looked to the the examples of their grandfather’s generations: Those guys had beards, wore dirty work clothes, ground coffee by hand in the morning, shaved with a straight razor, drove vehicles that required a lot of maintenance, maybe they used bacon grease for beard wax. They had tools and implements that required maintenance and were not disposable i.e. you fixed things instead of buying replacements. Look at the popularity of old time string band music these days, or even the late career celebration of Johnny Cash, for example: Grandpappy’s music. Its cool. I get it. And a lot of supposed “Redneck hunters” get it. If you are a self described “hipster” coming to into hunting, consider what you can add to the pursuit, not what you can take away from it. Carnivores have intestinal tracts that are only 3 times the length of their body. Herbivores have intestinal tracts 10-12 times the length of their body. Humans have intestinal tracts that are 10-12 times the length of their body therefore humans are Herbivores. To further this argument, often the antagonists suggest that the fact that humans lack teeth and claws is empirical evidence that humans are unfit for meat consumption. Some arguments go further and also claim that Herbivores perspire through skin pores, humans have skin pores, therefore humans are herbivores. Examining the evolution of the Guts and Brains of genus Homo, there is a clear relationship with hunting and gathering. Lieberman demonstrates that both the intestines and the brains are very calorie costly tissues, each requiring about 15% of the body’s total metabolic toll and each requiring similar amounts of blood and oxygen. A unique characteristic of humans is that both our guts and our brains are very large. If you compare humans to other animals of similar body mass, the animal brains are much smaller while their guts are much larger -usually twice as large as the intestines of humans. Basically, humans have comparatively small guts and comparatively large brains. Referencing the Expensive Tissue Hypothesis (Current Anthology vol 36/ Aiello, Wheeler), the conclusion is that hunter gatherers traded off large guts for even larger brains by gradually shifting to higher quality diets that included meat as a cornerstone. Conveniently, arguments that counter this conclusion tend to omit the importance of tools and weapons. Humans were able to digest a wide variety of food that included meat, fruits, tubers, nuts and seeds because they had developed the ability to process these foods through means of slicing, grinding, tenderizing and, of course, cooking. Based upon this, “the energetic benefits of hunting and gathering appear to have made possible the evolution of bigger brains in part by allowing the first humans to make do with smaller guts” (Lieberman, 92). Carving out an existence by hunting and gathering required more cognition (i.e. a larger brains): Bands of humans had to cooperate and further develop technology in order to survive as hunter gatherers. Likewise, our bipedal frame, unique ability to perspire and lack of fur allowed us to run great distances without overheating. Hunting and gathering shaped and directly influenced the human genome. We are what and who we are because of hunting and gathering. Hunting= meat, therefore, humans evolved to consume meat as well as a variety of wild foods. Over the last few years, I have experimented extensively with various ways of roasting squirrel. 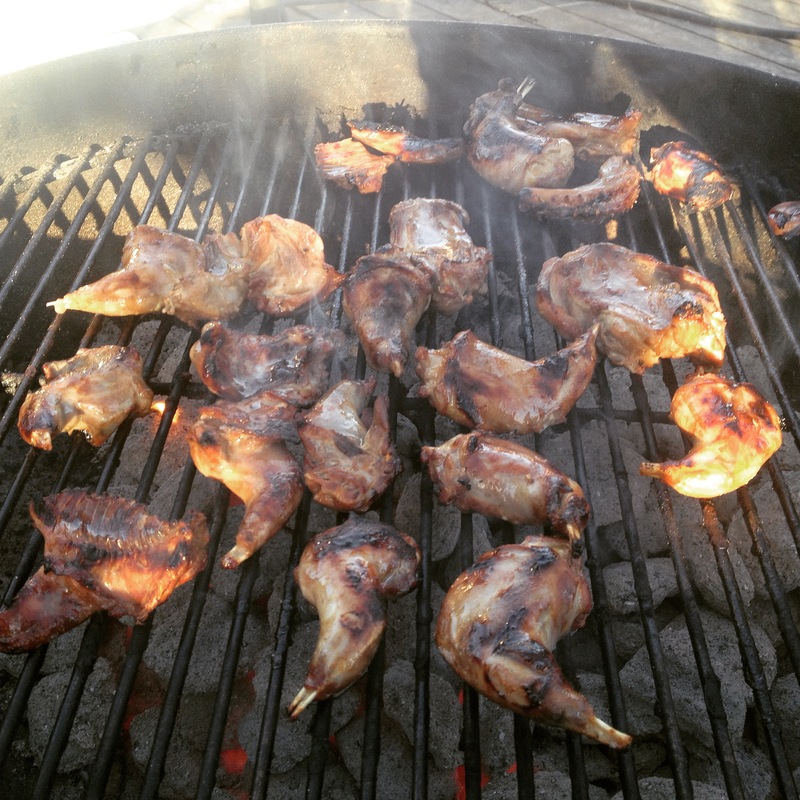 The topic of slow cooking squirrels has been thoroughly covered, but there still seems to be some mystery when it comes to actually presenting a squirrel shoulder or leg off the grill. In order to produce tasty squirrel on the bone, the keys to success involve a two stage, pre cooking process: Brine and Marinade. For the brine, I tend to keep it simple: 4 to 1 water to salt ratio with some peppercorns. Heat the water enough to dissolve the salt and cool. That’s it. Given their size, squirrels don’t require a long brining process and four hours should get the job done. The purpose of the brine is for moisture retention. Basically, it is a osmosis process that allows the meat to retain moisture by denaturing the proteins. Following the brining stage, rinse the excess salt from the meat, pat the meat dry and move on to the marinade. If you break down the fundamentals of a marinade, you’ll discover that you need fat, sugar and acid. This sounds simple enough, eh? For example, Olive oil (fat) + honey (sugar) + lemon juice (acid) would accomplish this task just fine. Many marinades call for ingredients such as Italian dressing which contains oil, sugars and vinegar and accomplishes this end with one bottle off the shelf. Soy sauce is also a popular ingredient since it is so acidic. The same applies to orange juice. Marinades aren’t difficult to improvise once you understand the foundations. Want to go Southwestern? Some chilies, lime juice, oil, and a bit of sugar will get you there. Jamaican? Assemble a jerk marinade on those same principles: Scotch Bonnets, Orange Juice, allspice, brown sugar, vinegar, olive oil, lime juice, garlic, vinegar, fresh herbs etc. Its easy to do various combinations until they taste “right”, add the meat and allow them to marinade overnight. 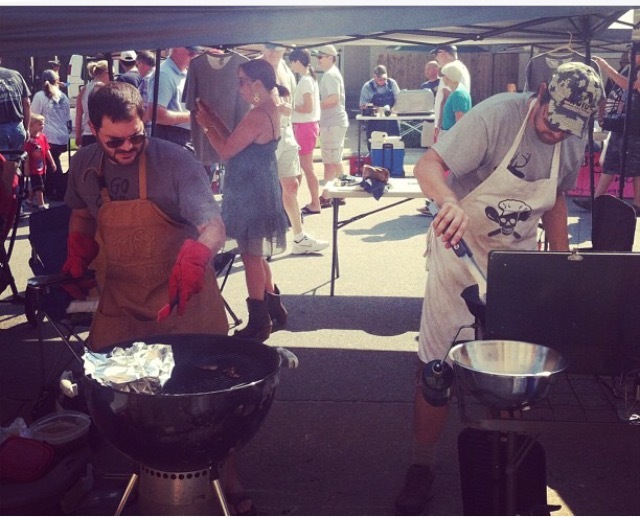 That’s us, competing in the 2013 World Squirrel Cookoff in Bentonville, Arkansas. We spent several months experimenting with brines, marinades and cooking “unapologetic”, whole muscle squirrel over flame. Since squirrel meat tends to be tough, I have found that a longer marinating process, say 12 hours or longer, seems to help. From there, I roast them over flame, a few minutes on each side, brushing with melted butter. I then finish in foil for 20+ minutes (as with most game meats, you allow different lengths of time for size and age of the particular animal). Brine, marinade, flame, foil. This combination will get you there. I have even gone so far as to have a brine waiting in a cooler in the truck and immediately dropped squirrel meat in the brine upon completion of a morning of squirrel hunting; Marinade in the afternoon and cook that night. This method is reliable enough (and popular enough with friends), that I almost never slow cook squirrels anymore (I reserve that process for much meatier swamp rabbits). For many people, eating squirrel is a bit of a novelty. I know this because I have probably given several dozen or more people their first taste of squirrel meat. As a result, I tend to eschew the popular method of making squirrel dishes where the meat is in a virtually unrecognizable form. I prefer the “This is squirrel: it looks like squirrel, tastes like squirrel…. you know for a fact that you are eating squirrel” method. It makes it more fun and interesting. Try experimenting. Squirrel roasting over flame. I did this batch today for a potluck. It started out as a Paleo potluck dinner for my Crossfit box, but, as I expected, it quickly turned into a “anything goes” potluck. I went middle of the road. Squirrel, of course, is about a natural of a sourced meat as you can get. I was in the mood for a Asian profile, so I used Soy Sauce, Olive Oil, White Wine, Vinegar, Juice of Lime, Honey, Garlic and Sugar for a marinade. I marinaded the squirrels for almost 24 hours, allowed them to come to room temperature, placed them on a hot grill and brushed them with a mixture of butter and pork lard (melted butter by itself will be fine) until brown on each side. I then placed them in foil and finished them for about 20 minutes with the lid on the grill. They were a big hit and quite a number of people had their first taste of tree rat. 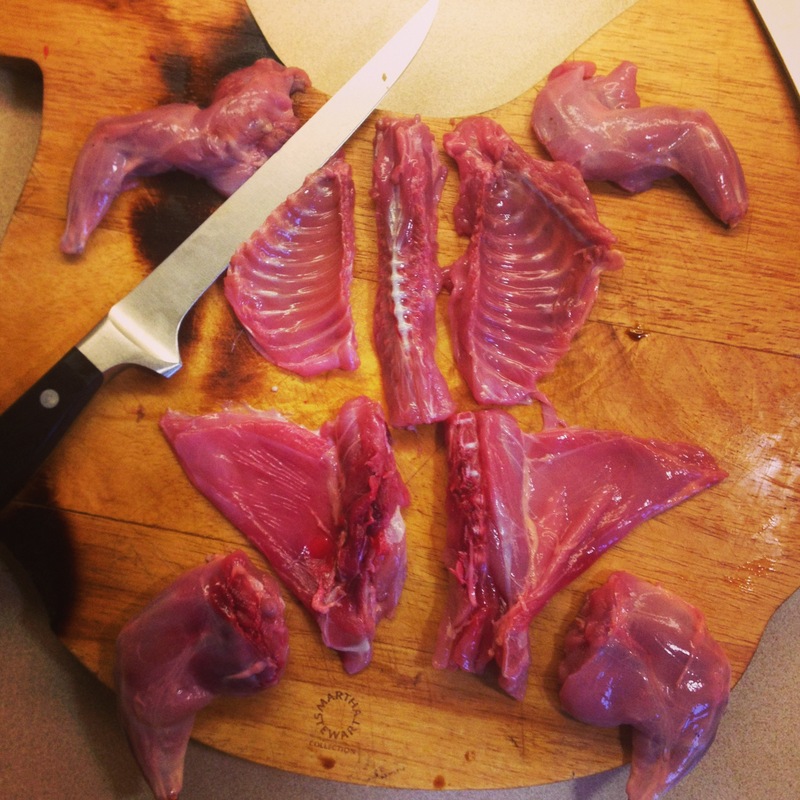 Looking for advice on squirrel skinning? Here you go. As a hunter preparing to pursue Elk and other game in the mountains, there are multiple factors to be considered in your training regime. 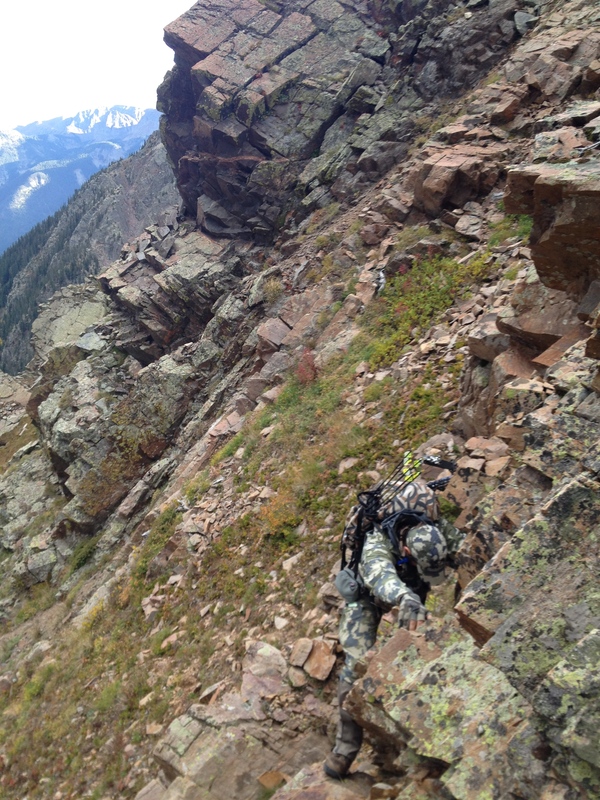 Strength is what is going to get you there and is likely one of the more overlooked aspects of preparing to hunt in the mountains. I’m not talking about conventional bodybuilding where you are pumping iron in the 8-15 rep range to build muscle mass. 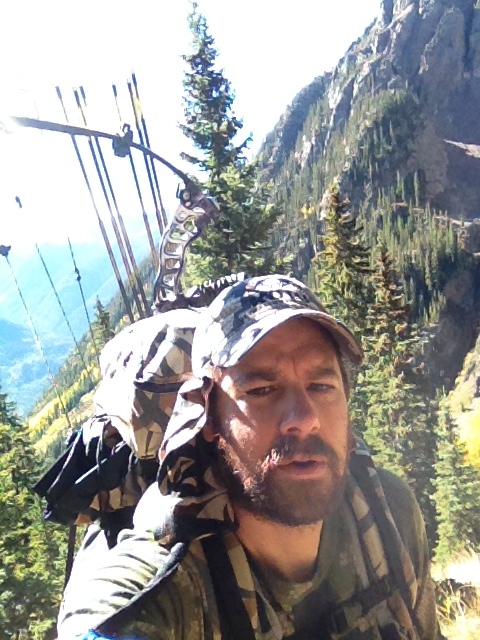 Excessive muscle mass is not what you want for mountain hunting. You need lean, functional strength that will balance you out as an athlete, keep your body moving under the weight of a pack and help you avoid overexertion and injury under that same weight. Your strength training should, for the most part, consist of heavy lifting, ideally in a percentage based program, generally of reps in the 1-5 range. While legs and core are the most critical for backpack hunting, you should incorporate full body strength program in order to be well rounded and to avoid injury. Specific to backpack hunting, back squats, front squats, deadlifts and cleans are all critical and functional. That being said, backpacking generally relies upon the independent function of each leg and therefore, lunges, one legged squats, barbell box step-ups should be used as well. Overhead squats and overhead lunges can certainly have an application as can snatches and other olympic lifts if you have the proper coaching to learn the technique. Muscular Endurance is the ability to perform a task over and over again. Long, sustained climbs up the sides of mountains will tap your muscular endurance. 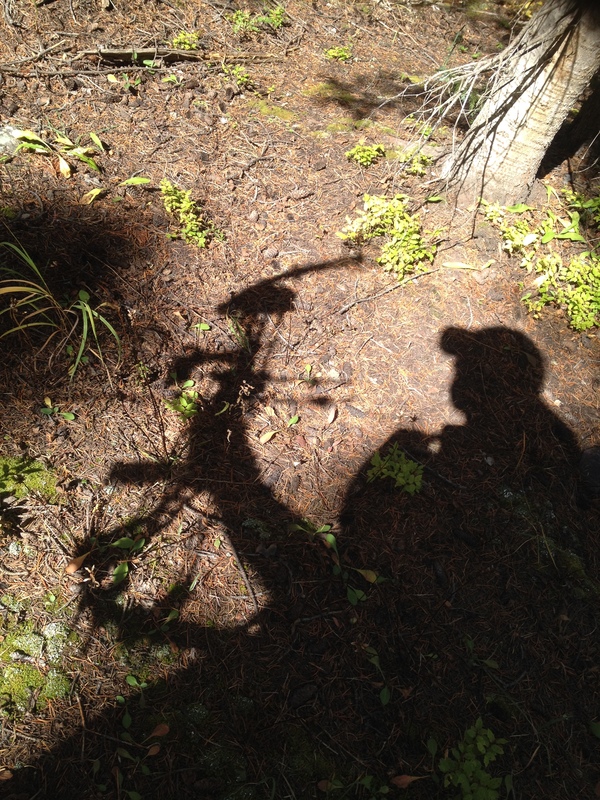 You require the ability to go all day up steep terrain with weight on your back. Training for muscular endurance will generally have you training in the 15-50 repetition range. For this, body weight and weighted lunges are excellent. Jumping squats, air squats, Kettlebell swings, power cleans and even deadlifts fit the bill. Note the weight differences between the lifts that show up on strength as well as muscular endurance activities. Also note that strength will contribute to your muscular endurance. Cardio Endurance is your body’s ability to deliver oxygen and blood in ample supplies and do this over a sustained period of time. There are two popular methods to addressing Cardio Endurance. There is the Long Slow Distance (LSD) method which entails many hours of moderate, but sustained training similar to what you will actually be doing. There is also a newer school of thought called High Intensity Interval Training (HIIT) that reports to achieve the same ends as LSD through less actual time but at much higher focused intensity. Benefits of LSD training: Can more accurately simulate what you are training for. Have a better measuring stick of your conditioning. Negative aspects of LSD: Injury prone. Loss of muscle. Requires massive amount of training hours. Benefits of HIIT: Increases the amount of time you can function at or near your V02 max. No loss of muscle mass. Less prone to injury. Fits better with in real world training schedules. Negative aspects of HIIT: Not as much direct frame of reference for your conditioning relative to what you are training for. May not leave you mentally prepared for the long hours of the tasks you will be actually performing. This argument (HIIT vs. LSD) can lead to passionate debate from both camps. I do not think that HIIT programs should necessarily be relied upon exclusively unless you have “been there before” and have a conceptualization of what it is exactly that you are training for. If you do have a concept, I believe that a HIIT program can be highly productive. In fact, for the most part, I have chosen to go this route with my training and seldom do individual sessions longer than 60-90 minutes. I’m not implying that this is the best or only route to go, only that it is “one way” to go that happens to be very effective. 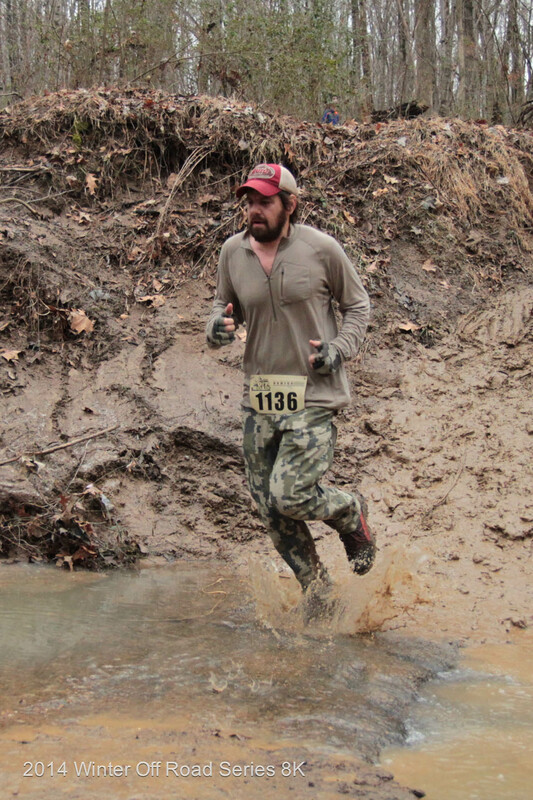 Examples of Cardio Endurance activities: Running, walking, hiking, rucking, swimming, biking, stairwelling, jumping rope. You could also incorporate calisthenics into this category using pushups, pull ups, situps, burpees etc as well so long as you maintain an aerobic (not anaerobic) heart rate. Doing a 13 mile hike at a normal backpacking pace would be an example of LSD training. Doing laps on a steep hill as fast as possible, possibly broken up with another task task such as burpees, for 35 minutes would be an example of HIIT training. 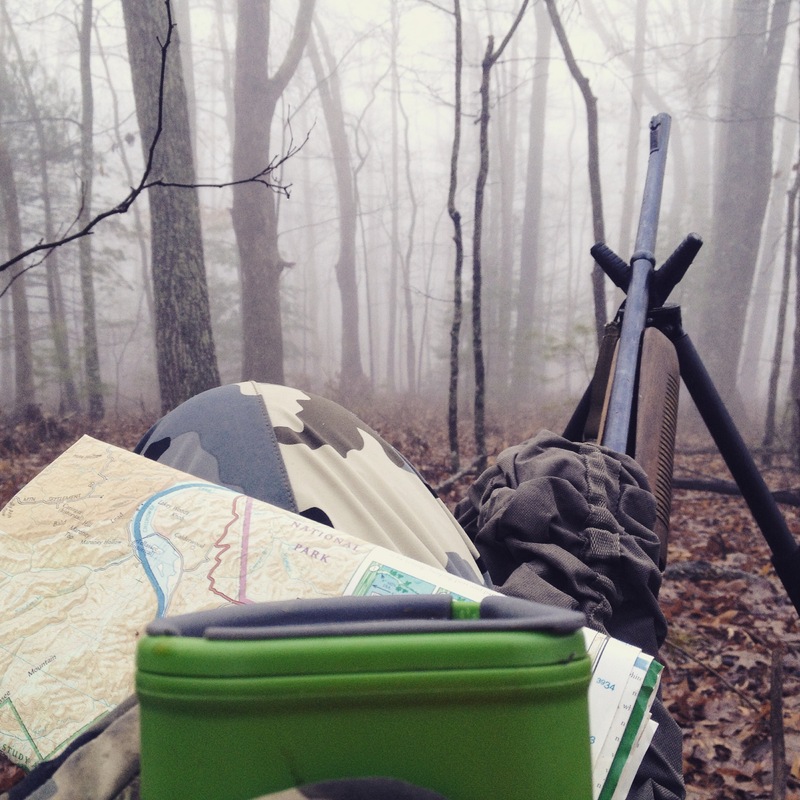 So, what do you need to do to prepare for hunting in the mountains? I am going to go ahead and say that one of the most important aspects to your training is choosing an actual program to some extent or another. Among hunters, the actual program itself is often another hot topic for debate, so let’s hold off on that for a moment and discuss programming versus freelancing. A program, to whatever extent, is going to have you doing specific tasks for specific purposes in order to accomplish specific results. For example, the programming for a football lineman might be different than the programming for long jumper or even a football running back, for that matter. Each athlete is expected to perform different tasks and their individual programming will likely reflect those tasks. So, for the hunter, what do we need to be able to do? Go all day (usually very, very, very long days), uphill and downhill, hauling a pack, over potentially semi technical terrain for many consecutive days. We also need to be able to haul potentially heavy loads, even “extreme” loads, for long distances, over semi technical terrain and for consecutive days on end. Considering the rather specific and relatively straight forward physical demands of hunting, the conditioning programming would seem rather straight forward and, it certainly can be, if you prefer. Or, you can take a more complex approach. Successful hunters have taken both routes and make cases for both the simple and the complex programs. Personally, I am going to defer to a slightly more complex approach over a plane of time as opposed to the most obvious approach, which would be hauling a heavy pack up a hill on a regular basis. The reason I encourage more variation in your training is because performing this relatively simple task over and over again makes it easy for you to reach a plateau in your training, may make a case for injury and overtraining, and even a loss of critical muscle. For example, performing the Sisyphian task of weighted uphill conditioning ignores the aspect of balancing your posterior chain with training that may prevent injury while navigating technical terrain that requires additional mobility, not to mention the Herculean task of shouldering a pack heavy with game meat. Such specific strength and mobility will likely achieve the best result in the controlled, laboratory setting of the gym. So sure, if you spend 200 days a year in the mountains performing such tasks, you probably have no reason to read this to begin with. For the rest of us, the gym is our laboratory for mountain conditioning. Programming: You can create your own, you can find or borrow someone else’s, you can buy a program, you can hire a trainer, buy into a program etc. There are many options here, but know that you will likely achieve the best results following a program of some type rather than freelancing on a day to day or even week to week basis. Train to Hunt, as you gathered from the name, is just that: A training program specifically catered to hunters. You pay for a subscription, take conditioning assessment and are assigned a program with regular online interaction with your coach. You’ll spend a fair amount of time training with a pack, will need some equipment. Presumably, a gym membership of some sort will help, but is not necessary. Pros: For Hunters, by hunters. Sport specific. Interactive coaching by guys who have been there. Any level of fitness. Supports hunting and hunting culture. Cons: Costs money, requires equipment, no “hands on” coaching. Mountain Athlete, as, once again, the name implies, is just that: Programming geared towards mountain athletes: Skiers, climbers, runners, hunters, firefighters, military, first responders, backpackers etc. Mountain Athlete has an assortment of customized programs available for purchase including a 6 week, big game hunting program. The programming does require gym access. The FAQs and Q&As on this site are excellent resources unto tehmselves. If you are off the couch, you may need to buy a intro/basline fitness program before starting the hunting specific. Pros: Sport specific, appears to be well organized and objective based with a focus on strength. The coaches are interactive and knowledgable. Cons: Costs money. requires a gym membership. assumes a baseline of fitness. no “hands on” coaching. No built in training partners. Crossfit is a popular and sometimes controversial method that many hunters and other athletes use. The good news is that Crossfit boxes are virtually everywhere these days, making them and the onsite coaching accessible. 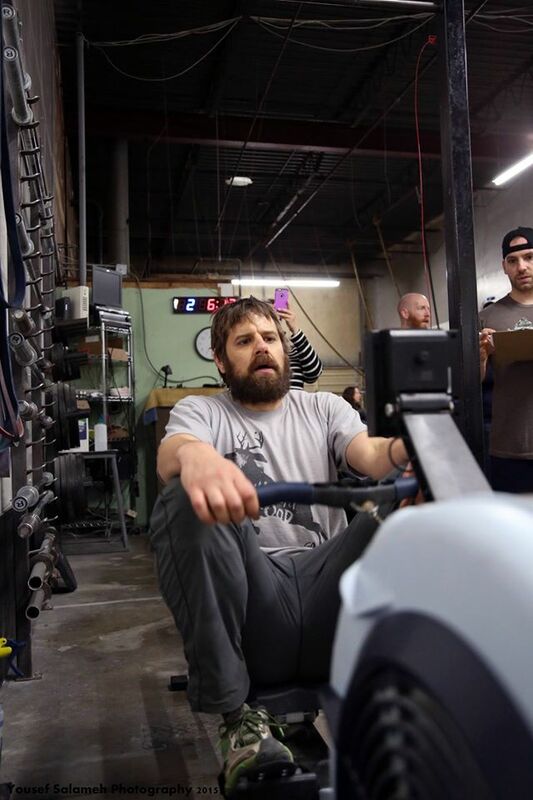 Crossfit is a very general programing approach and, while your hunting can certainly benefit from the training, it is therefore more of a longterm commitment to getting into hunting shape rather than a sport specific, “6 week” program. In other words, 10 months of Crossfit can arguably prepare you for the mountains, but it may not the best approach if you are 6 weeks out from your trip and in need of mountain conditioning. Pros: On site, “hands on” coaching, equipment is provided, physical locations, training partners, popular among hunters (one of my local boxes has 5 members who hunt). Cons: Costs money, expensive, not hunting specific, may require some supplemental training for hunting. Gym Jones Of the options listed, I know the least about this actual program simply because there is not a ton of info provided online. I am, however, quite familiar with the founder, Mark Twight, his accomplishments and writings. Based on that, I wouldn’t hesitate to recommend his programming. Though they do not offer a hunting specific program, I’m sure the staff would be able to recommend one of their existing programs or even merge several program into one adapted for hunting. Gym Jones is a super high level, exclusive operation geared towards professional athletes. Based on that, I would assume a certain level of competency be in place before signing up. Cons: Costs money, not hunting specific, requires gym access, unknown variables such as coaching access etc. Anyway you approach training to hunt in the mountains, you will benefit the most by adopting training as a continuous part of your lifestyle rather than preparation that gets squeezed into a short period of time. In the book Unbreakable Runner, Crossfit Endurance founder Brian McKenzie discusses the concept of “Endurance with Teeth”, which is essentially the concept of staying in constant competitive condition without the real need for “peaking” at certain times of the year. With an overall lifestyle change, one can be ready to chase Elk around the mountains with very little specific conditioning outside of their day to day training. No matter the type programming you chose, make sure that you remember that recovery is greater than 50% of your progress and mobility work is every bit as important as strength and conditioning. Nutrition will make or break you. If you are not healthy, you cannot make progress. Get after it! Chef Margarita Carrillo Arronte has a extremely thorough and well researched new cookbook out called “Mexico”, which details numerous traditional Mexican cuisines by their region. If you are into traditional Mexican food at all, you can’t go wrong with this book. I did come across at least one Venison and one Rabbit dish, though curiously, the index appears to be missing references to both meats.”Venison Dzik”, a Yucatan dish, looks interesting and simple as does the Mexico City inspired “Rabbit in Prune and Chili Sauce”. Flipping pages and reading recipe titles such as “Pork Shank in Chileajo”, “Stewed Beef in Chili Sauce” and “Steak Nicolasa”, the wild game cook’s gears can easily began to churn with game meat applications. 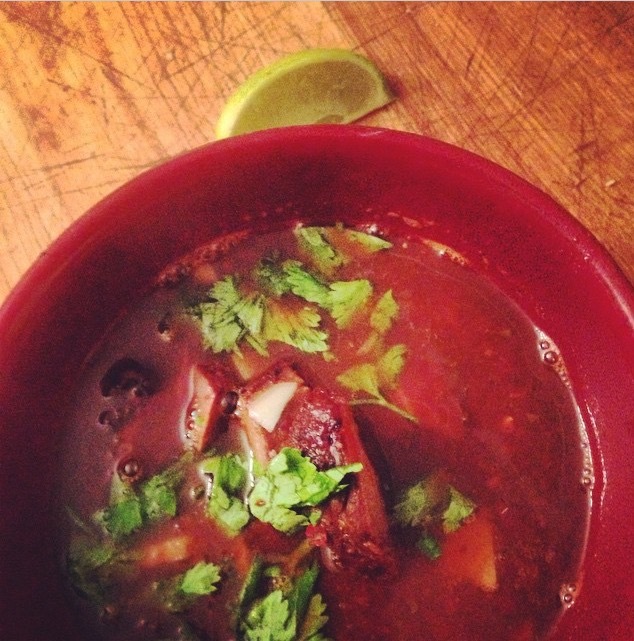 Birria is a spicy stew dish usually made with goat meat, but lamb and even chicken and beef are often used as well. Birria originates from the Jalisco region and is a particularly popular street food in Guadalajara. There are numerous variations on this excellent dish. 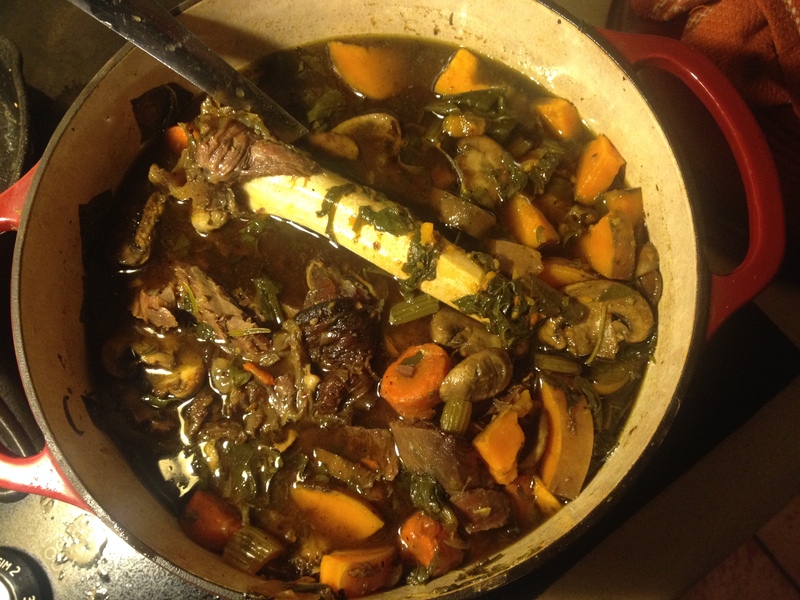 Substituting Venison for Lamb, we adapted Chef Arronte’s instructions for this traditional dish. You might note that the roasting method is remarkably similar to the finishing stage of our venison pastrami recipe. Roasting venison over a tray of water is a very efficient method for maintaining moisture. Note that this dish contains no supplemental fat. Feel free to add a bit of bacon, pork belly or lard if you wish. We did not find it necessary, but the option is listed below. Place the chilies in a saucepan with enough water to cover and bring to a boil. Remove the pan from the heat and soak the chilies for 20 minutes. Drain the chiles, reserving the liquid, and place them in a blender or food processor. Add garlic and vinegar and process to a paste. Add cinnamon, ginger, 1 tsp oregano, cumin, pepper, salt and process again until it forms a thick paste. If necessary, add some of the reserved liquid. Rub the paste all over the venison, cover and allow to marinate overnight. Preheat the oven to 350. 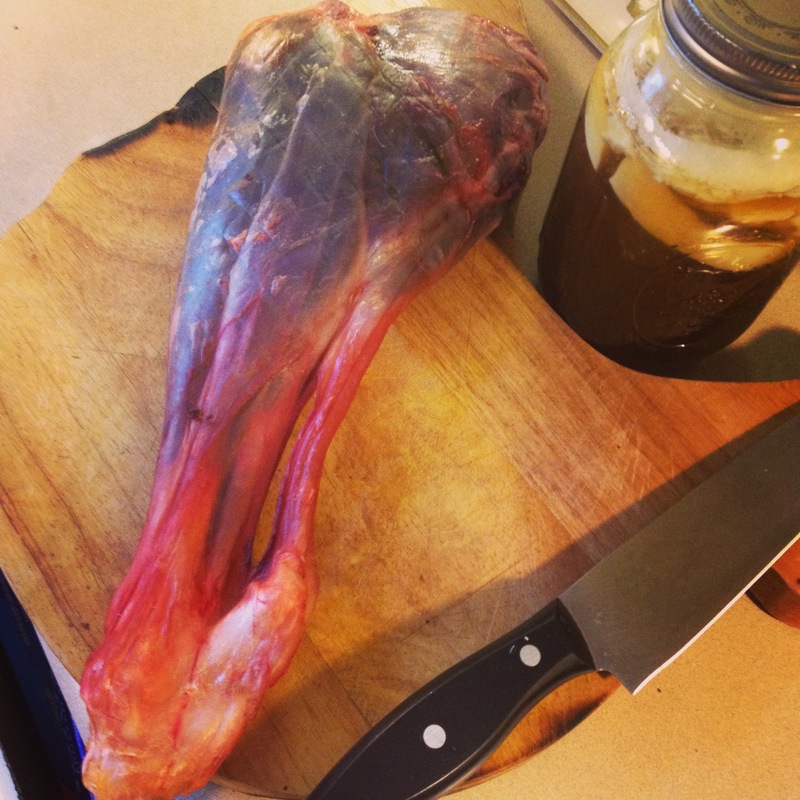 Place the venison on a wire rack over a roasting pan filled with water. *You may add a bit of fat. You can place some bacon on the rack with the venison or just add some lard to the water or just bypass adding fat altogether. 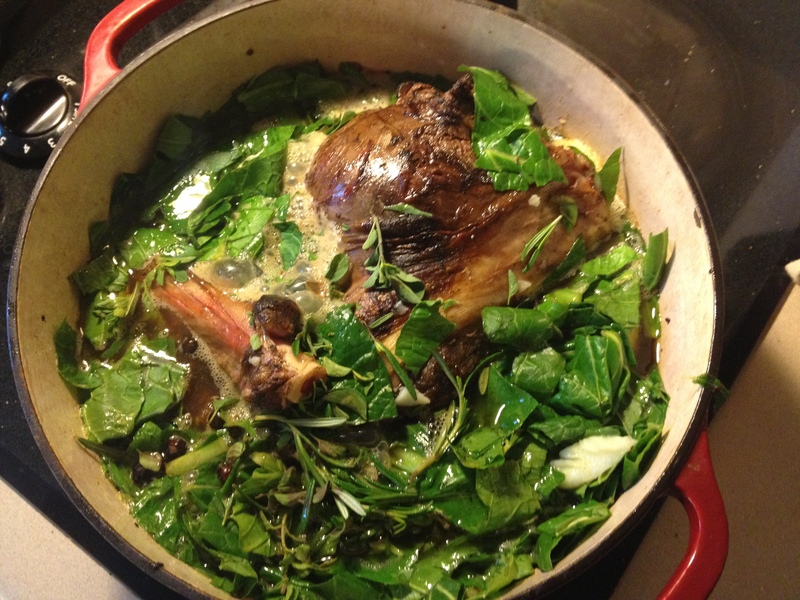 (with lamb or goat, fat would drip off the meat into the water). Wrap the whole setup tightly in aluminum foil and bake for 4-5 hours until the venison is tender. This process should keep the meat moist. If the meat still seems tough, wrap it directly in foil with some of the liquid and braise it on high heat until the meat reaches desired tenderness. (there are always variables for tougher venison versus more tender). Reserve the liquid in the roasting pan, cut the venison into bite sized chunks and brown them in the oven for a minute. Pour the cooking liquid into a saucepan. Place the tomatoes, oregano, and stock into a processor or blender and process until smooth. Add this mixture to the saucepan, bring to a boil and then let simmer for 15 minutes. Add the liquid and meat to bowls and garnish with cilantro and chopped onion. Lime juice and hot sauce as needed. We spent six crusty days in the Smoky Mountains of Tennessee, having the first two days to hunt Whitetail and then another four days for the late season bear segment which also allows for the opportunistic taking of wild hogs. The trip effectively closed out our 2014 big game season. Though poor visibility and rain prevailed, it was still an enjoyable trip. 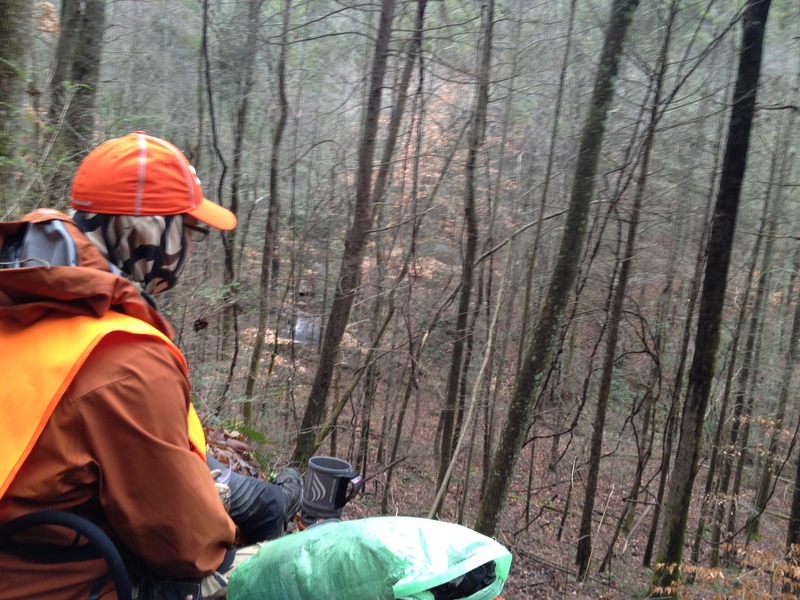 We had departed a dense deer population with liberal bag limits in West Tennessee and travelled across the state to arrive in an area with a notoriously low deer population and heavy restrictions. Once camp was established, we set out to hunt these sparse, mountain Whitetails. With visibility limited to 40 yards or less, we promptly plopped ourselves down on what the topo indicated as prime terrain funnels. Having been awake for nearly 40 hours, hallucinations in a semi dream like state set in almost immediately. This was only intensified by the dense and erry fog. 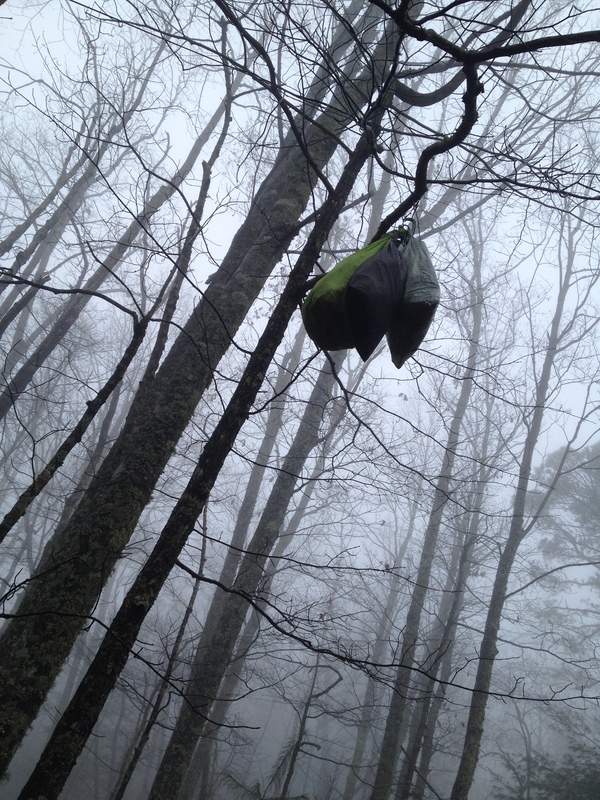 -Food bags hung high in camp- We spent the following day in similar conditions, moving from one terrain funnel to another, but saw no deer movement. Rain was constant and condensation was out of this world. We had to break down our rifles nightly and perform thorough cleaning jobs to prevent rust. The TiGoat stove paid off big time in dealing with the moisture. 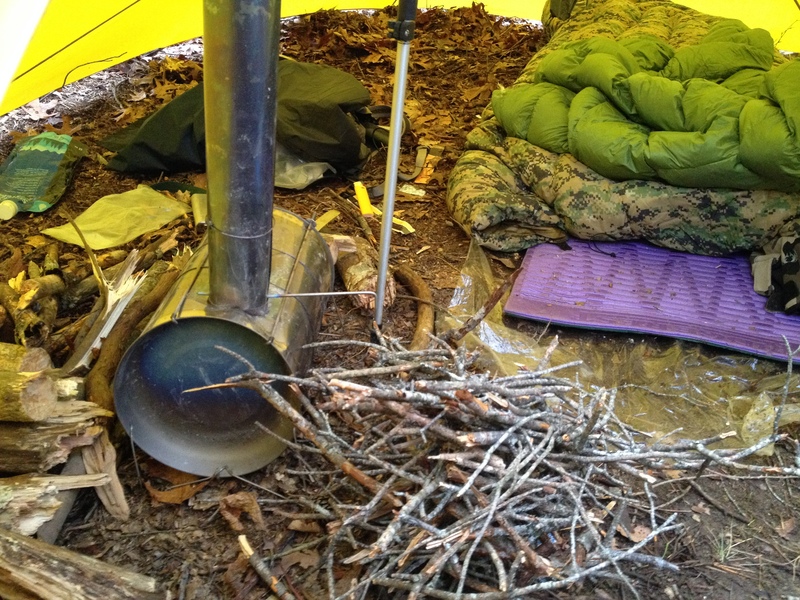 We were able to dry most of our gear out each night and stoke the stove before heading out each morning. This would effectively dry our down quilts out while we were out hunting. Condensation was so bad that that it was almost raining inside of our shelters each night. Without the stove, I’m not sure we would have made it past day two. When the cold front moved in, we needed every bit of the insulation we had available in order to stay warm. Because it was so wet, drying out firewood became a near constant task, though this method of stacking wet wood on the stove proved quite effective. On the third day, the late bear hunting season opened and we set out to cover as much ground as possible. 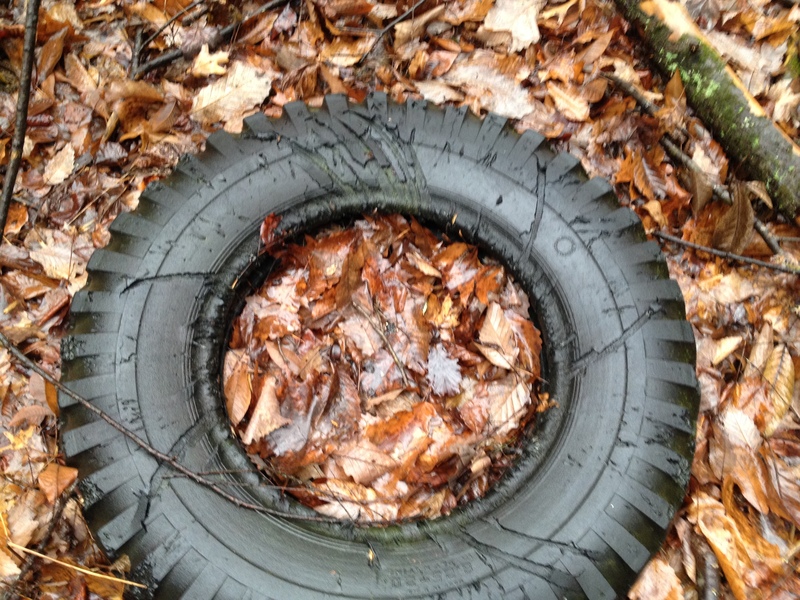 We had already seen numerous bear sign in our immediate area, mostly in the form of territorial markings but also droppings and even a tire that had been washed down a creek system. After a full day of plowing downhill through dense cover into a drainage, we found an abundance of very fresh hog sign. Since it looked promising, we made plans to return to this creek at first light and ascended eleven hundred feet back up to camp. The next morning’s sit revealed no hogs, but we did encounter the first of several bear hounds that we would see and even share our camp with over the next few days. These hunting hounds tended to stay focused on the the drainage where we encountered the fresh hog sign. 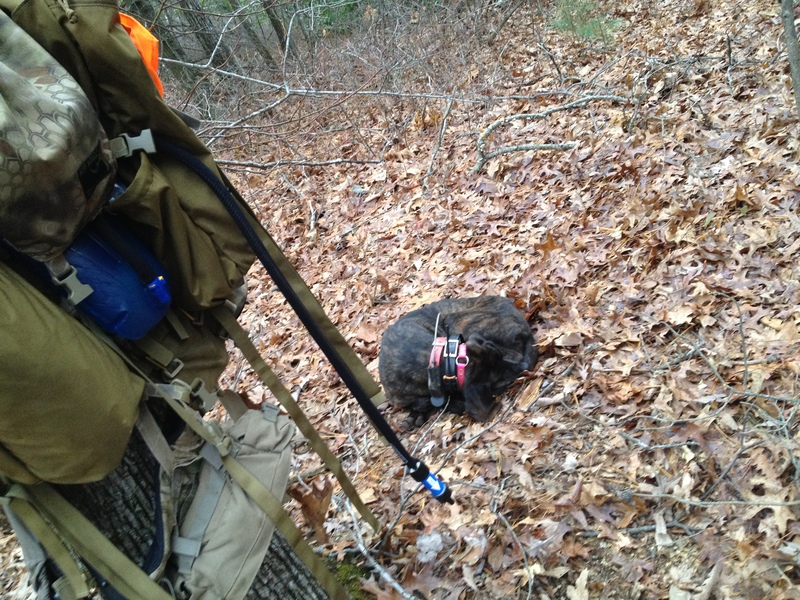 We had more than one spend the night in our camp, shared some of a jerky with a particularly worn out Plott hound and a couple of the dogs took up with us for portions of the days while we were hunting. In the end, these dogs neither helped us much nor did they hurt our efforts. 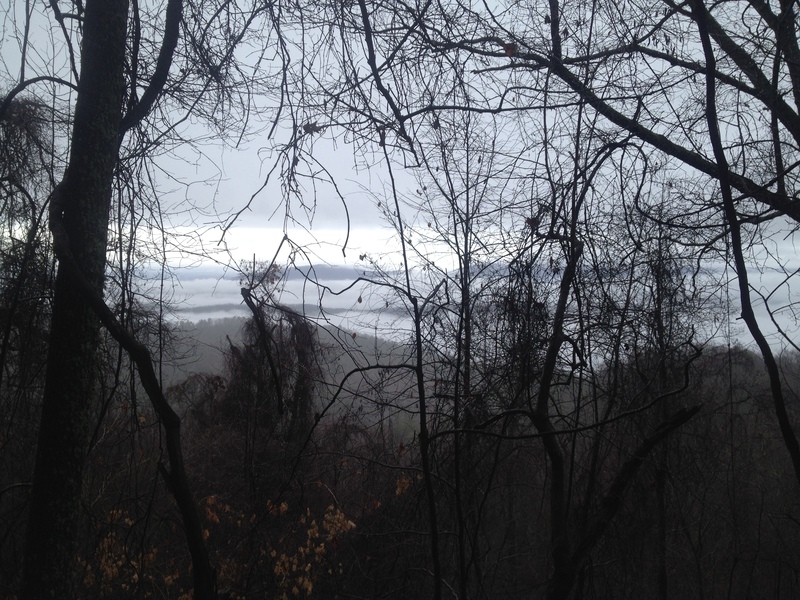 2014 proved to be an absolutely unprecedented year in terms of mast in the Smoky Mountains. Walking around in the woods was akin to walking on marbles. Acorns were literally everywhere. This abundance of late season food source was the primary reason we took this late season trip. Normally, most bears would be denned up this late in the year, however some recent unseasonably warm weather and ample food supply had many bears still on the move. After three days of dismal weather, the sun finally revealed itself and we could finally get a good look at our surroundings. Thick woods of the the Eastern US still make spot and stalk pretty much impractical. You either have to encounter animals at terrain funnels or food sources (or just get real lucky). Since food was so abundant, we attempted to cover as much ground as possible hoping to encounter a bear. On our fifth day, we put in a tremendous effort and covered many miles including a long, five hour climb up the North Face of Stiffknee Top. We expected to encounter an old logging road or even a trail on top, but we were instead greeted with virtually impassable patches of Rhododendron. The final 2.5 miles back to camp, which we expected to knock out relatively quickly, ended up taking hours. You know those WWII reels of Sherman tanks getting stopped in their tracks by French hedgerows? Yeah, that was us. My latest generation sleep system includes an Enlightened Equipment down quilt. On this trip, I brought a section of a foam pad as well as my 3/4ths length Neo Therm. After some experimentation, I think that I am going to switch to a full length XTherm. The Feathered Friends down jacket was an excellent upgrade from my 16+ year old TNF puffy which was constantly leaking feathers and had lost a good bit of its loft. 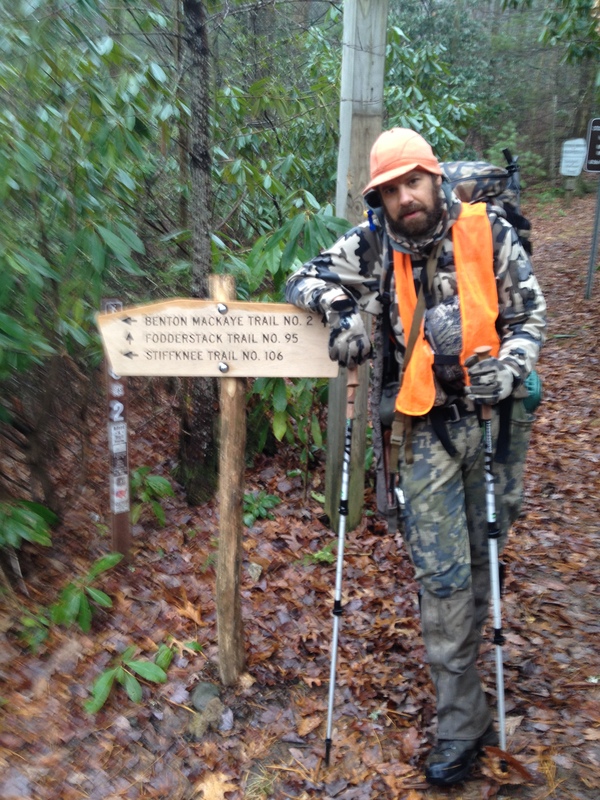 And on the sixth day, more weathered moved in, so we packed back out in the rain with a Plott hound in tow. Despite not seeing any big game animals, this was a productive trip. I definitely feel more confident in my ability to deal with wet weather for extended periods of time while out hunting. 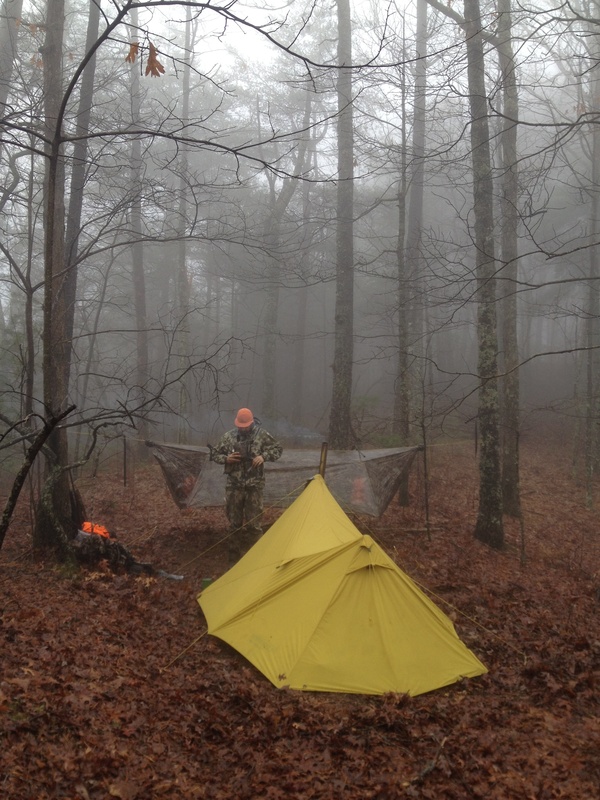 Its one thing to deal with these conditions while backpacking or out day hunting, but adding the element of multi day hunting under the limitations of backpacking really makes matters more complex. 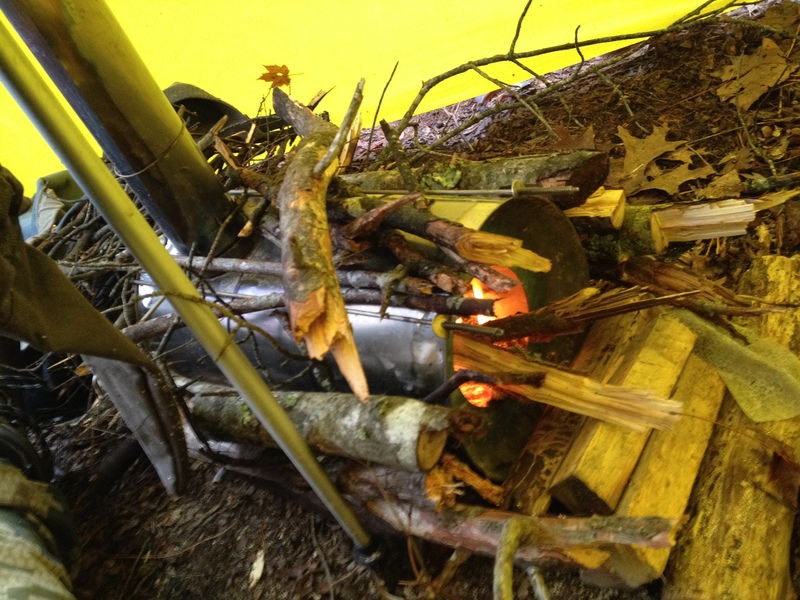 Much like the Big South Fork trip, I was able to further experiment and dial in my cold weather sleep system. We also had the chance to again test our conditioning out in the mountains. 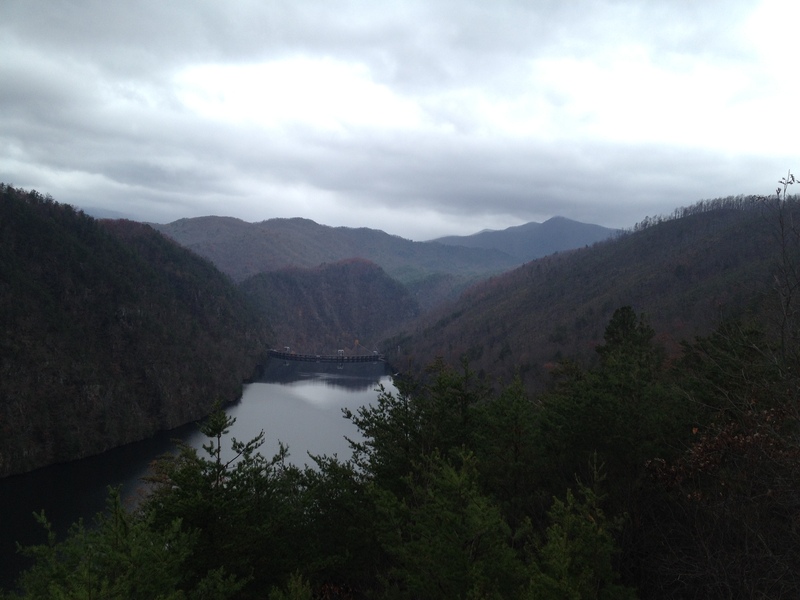 Though the Smokies do not offer the elevation or the sheer amount of objective dangers of the Rockies, you certainly can find comparable terrain in terms of sheer steepness and sustained switchbacks. 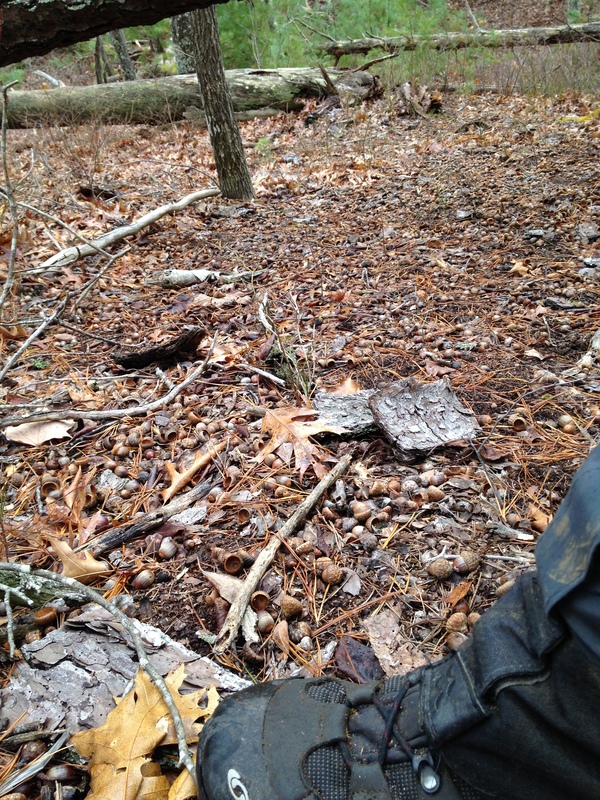 -definitely a good testing ground for any Eastern U.S. based hunter. 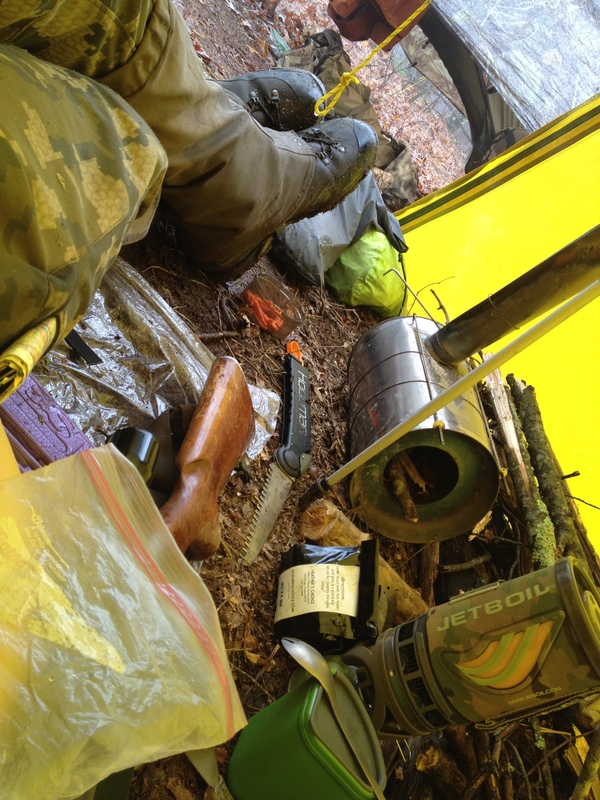 Once again, the Heather’s Choice dehydrated meals really shined in terms of backcountry nutrition and meal satisfaction. When its cold and miserable out and you are expending thousands of calories a day chasing game animals around the mountains, its psychologically imperative that you have meals to look forward to that are both replenishing and rewarding. On this trip, I again took a mixture of Heather’s Choice, Mountain House, Alpine Aire and Backpacker’s Pantry brands of meals. Of the four, I think I am done with Backpacker’s Pantry. Though their menu sounds more creative and appealing then the Mountain House selection, they tend to end up delivering bland meals that offer little in terms of a meal to be excited about. Mountain House has only a few meals that appeal to me, but I may keep them in rotation from time to time. Next to Heather’s Choice, Alpine Aire seems to be my favorite. In particular, the Southwestern Style Masa with Beef is good and their desserts are almost mind blowingly good. In addition to the dehydrated meals, I also packed venison jerky, venison pemmican, fried country ham, and salami for some additional fat intake. It has been a great hunting season that has included two trips: A Backpack Elk Hunt in Colorado and a Backpack Whitetail Hunt along the John Muir Trail in Tennessee. 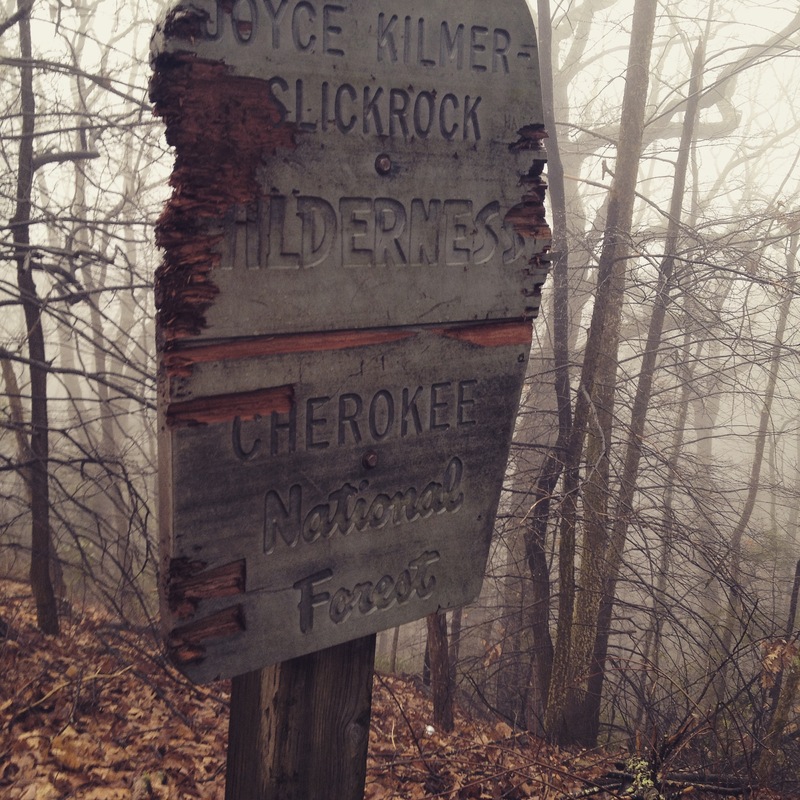 For the last few days of the season, we’re headed to Cherokee National Forrest on the Tennessee & North Carolina border to opportunistically hunt in the most remote corner of Tennessee. 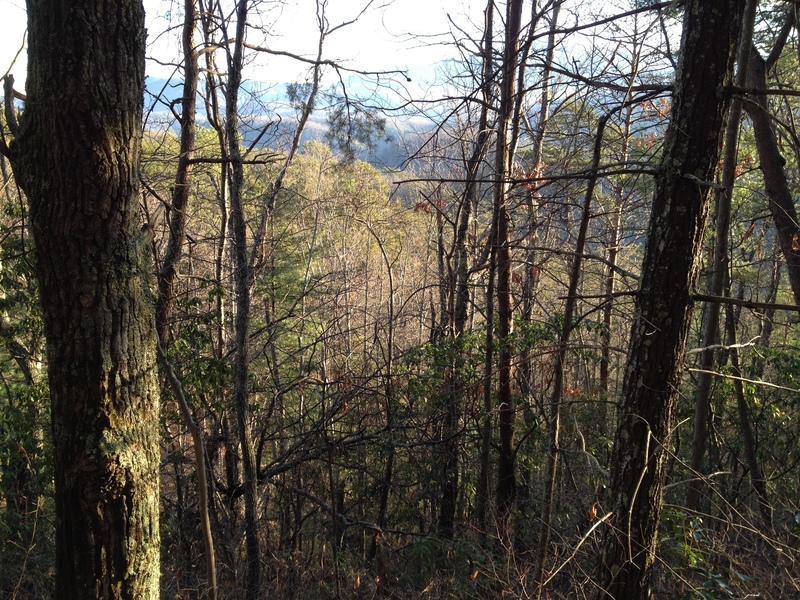 On this hunt, we have opportunity for Black Bear, Whitetail and even Wild Hogs. If you are not from the Southeast, it may surprise you that bears can be hunted this late in the Fall, but the Smoky Mountains are experiencing a bumper mast crop this year and we have had some unseasonably warm weather meaning that bears may not be necessarily denned up right now. My limited experiences with stalking bears in Tennessee has thus far been an exercise in futility, but I still feel compelled to hedge a bet on sheer luck. Look at that elevation change! 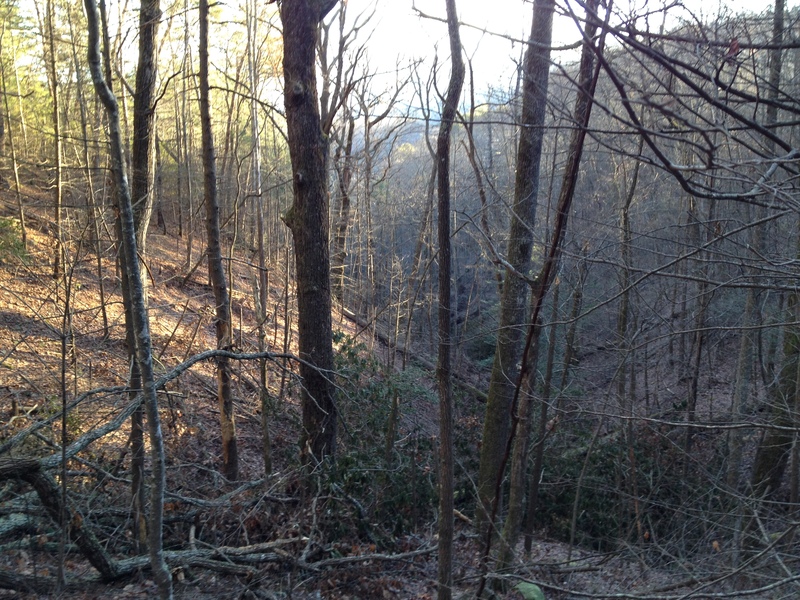 We’ll be running up and down those mountains , cussing at the thick brambles and undergrowth the whole time. Tennessee has taken a fairly non standard approach to stopping the spread of invasive hogs throughout the state. Cherokee does tend to hold a population of them, however, they are hunted hard with dogs (the most effective way to hunt them in this region) and tend to stay holed up in impossibly thick Mountain Laurel and Rhododendron, only moving nocturnally. 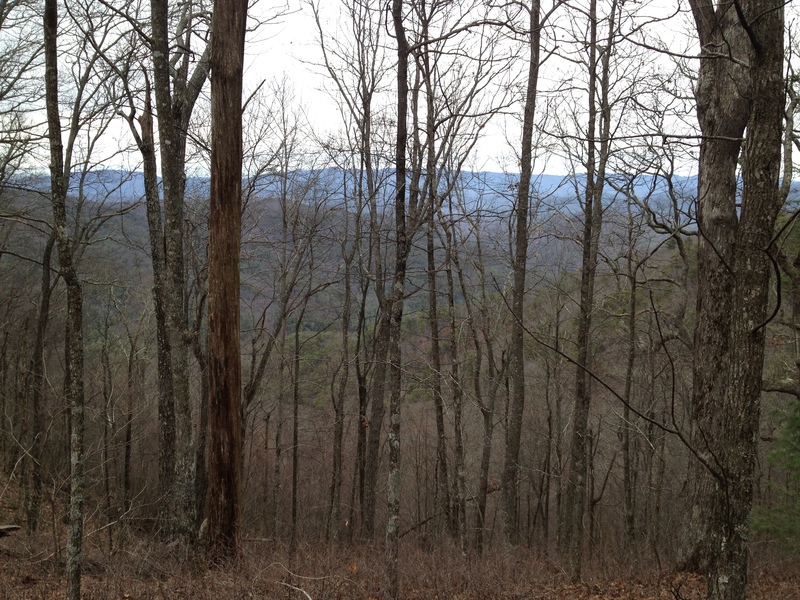 The proposition of Whitetail hunting in this part of the state is also fairly bleak. The general area we are going to has a reputation for very low deer numbers. Having previously hunted bear in that area, the lack of deer sign was a bit shocking (compared to what I’m used to in Middle and West Tennessee), to say the least. However, there ARE Whitetails in the area though we are limited to killing bucks only (bag limit for this period of time in Cherokee is Two bucks, though they are actually bonus bucks to the statewide bag limit of three bucks). In that terrain, in that part of the state, I would consider killing any deer basically equivalent to successfully hunting and killing a mature buck in other parts of the state. I am in need of one more deer for the freezer (though a bear or hog would certainly suffice) so I intend to fully throw myself at an encounter with a mountain buck before the final bear hunting segment opens. Once again, I’ll be travelling from one end of the state to the other, leaving and driving through areas with very high deer populations in order to hunt in an area of the state with the lowest population and most rugged terrain. Hunting is about experience. I also wish to fully take advantage of the resources (bear, hogs, mountains, large tracts of public land) that my state has to offer. If nothing else, it will be a backpacking trip with a rifle where I get the opportunity to tweak my backpack hunt set up for round two of Elk hunting in 2015. My gear list for this trip will be basically identical to the BSF hunt. Expect a full report upon our return. I’d really love to return with a load of black bear meat and fat, but I’m setting my expectations level well below my level of gratitude for even having the opportunity to even take this trip.